Back by popular demand, do NOT miss this essential overview and discussion of the leading family law and child protection cases of the past year. This program features chair, Justice Maria Sirivar, and speakers Aaron Franks (Counsel, Epstein Cole), Adam Prewer (Counsel, Epstein Cole), and David A. Sandor (Barrister and Solicitor, Child Protection Lawyer). This program has been approved as an Accredited Provider of Professionalism by the Law Society of Ontario. It contains 15 minutes of Professionalism Hours. This program has also been approved for a Risk Management Credit by LawPRO. Please click here to view the flyer! This program has been accredited for 1.0 Substantial and 0.5 Professionalism Hours toward total CPD Requirements. Annual General Meeting is taking place on January 17, 2019, at 6:00 p.m., at the Center for Social Innovation in the Atrium room, for more information on the location please click here. Election to the board takes place at our Annual General Meeting. Please consider becoming a member of our Board of Directors. If you are interested in running for election, please fill out a Nomination Form and provide a short bio and return them to me by January 7, 2019. If you’d like more information, please get in touch with me or any one of our existing Board Members. The Family Lawyers Association is deeply concerned with the Ontario Government’s plan to cut funding to Legal Aid Ontario by over 30 per cent. The FLA was founded 25 years ago in response to the legal aid funding crisis of the mid-1990s. Accordingly, the focus of the FLA has always been to work towards improving Legal Aid Ontario and protecting the rights of the most vulnerable low-income Ontarians. The FLA believes that all individuals involved in our family justice system should have easy access together with competent legal representation when dealing with the important issues affecting themselves and their families. Without adequate funding for LAO, the most vulnerable unrepresented litigants will be left to navigate the legal system on their own. The FLA is also gravely concerned with the Ontario Government’s position to no longer fund refugee and immigration law services. We urge the Attorney General to reconsider and redress the substantial cuts to LAO’s funding. Please see full statement and contact here. The 13th Annual Family Law Summit is taking place on March 18th-19th, 2019. This year, the FLA is offering a group registration discount for Members only! Please click here for information regarding group registration and details about the Summit. 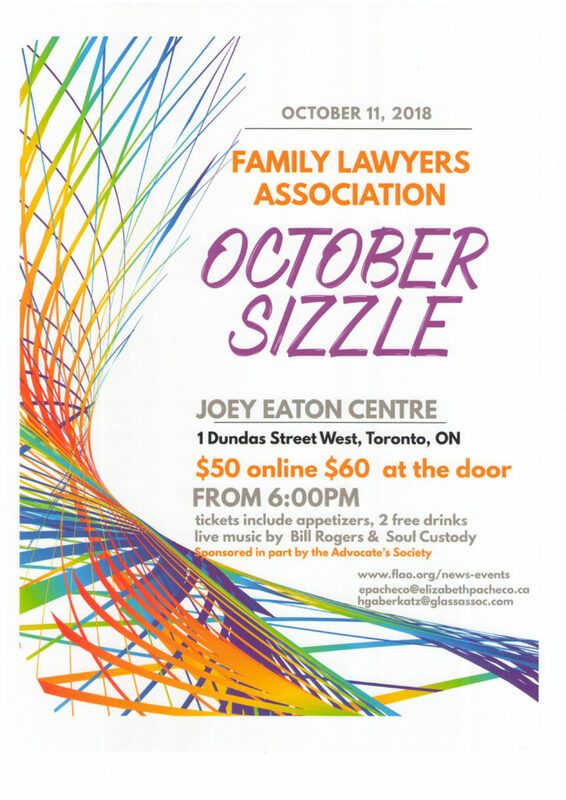 You are invited to the Family Lawyers Association Annual Social, the October Sizzle! Enjoy Bill Rodgers and his excellent band “Soul Custody”, food, drink, dancing, and good company! Tickets include two drinks courtesy of the Advocates’ Society, as well as amazing appetizers, decadent desserts, and yes, live music! Lawyers, judges, friends, support staff, spouses, partners, and others, significant or not, are welcome to join the fun! Tickets sold out last year so make sure you get yours early! AMENDMENTS TO FAMILY LAW RULES (O. Reg. 114/99) EFFECTIVE April 23rd, 30th and July 1st, 2018. Please see the Family Law Rules, O. Reg. 114/99 and http://ontariocourtforms.on.ca/en/family-law-rules-forms/ for details. 03 May, 2018: FLA PING PONG CHALLENGE! Winter weather got you down? Just finished a difficult trial? Why not invite opposing counsel to a (mostly) friendly game of ping pong, courtesy of the Family Lawyers Association? Join us for a fun evening of networking, drinks, and ping-pong! 28 November: FLA Annual General Meeting! Please join us at the 2017 Annual General Meeting of the FLA. This event is featuring a talk by Dr. Victoria Talwar, Associate Professor at McGill University, on “Assessing the Credibility and Competency of Child Witnesses”. Understand the capacities of children (including intellectual and language) and being sensitive to these when working with children. Explore issues related to interviewing children, and the impact of different questions, from both developmental psychology theoretical perspectives and practical applications in terms of best practice methods of interviewing children. 12 October 2017: The FLAO’s October Sizzle! Come join the Family Lawyers Association for our annual social, the October Sizzle! Tickets are $50.00 early bird, $60.00 at the door, and include one drink, appetizers and desserts – music and dancing also included. Judges, friends, support stuff, spouses, partners and others, significant or not, are welcome to join the fun! Email FLA Board members Anne Calpin at annie_calpin@rogers.com, or Gary Gottlieb at ggottlieb@gottlieblawfirm.com, for more information. Tickets can also be purchased online. Click here to download the flyer! Please find attached our board’s response to the Family Law Review, with schedules (Schedule A Part 1, Schedule A Part 2, Schedule B). Please also see the flyer for the upcoming Town Hall Meeting. Click here to access the FLA’s statement on the recent Family Law Review. The Family Lawyers Association will be commenting more fully on the recommendations in this report at a later date. I attach for your review the press release along with the link to the full report from the Family Law Services Review. The recommendations of the report go well beyond what anyone from the bar (including our “sister” organizations such as the Federation of Law Associations, the Advocates Society and the OBA) supported or even imagined. The recommendations are for non-lawyers (paralegals) to represent family law clients in a wide range of matters, inside and outside the court, without supervision and with very little training. The LSUC has invited comments from the bar on the report. The FLA will be making submissions on the report as we feel very strongly that the recommendations of the report do not advance access to justice. This has significant implications for all of us – we really want to hear your reactions and comments. December was a very busy month for the FLA and especially for the legal aid committee. Katharina Janczaruk, Julia Vera and Jean Hyndman met with the board of LAO on December 9, 2016 and presented our concerns about the family law legal aid tariff. On December 12, 2016, Katharina Janczaruk and Julia Vera met with the Law Society’s legal aid working group to voice our concerns about legal aid. Attached is the executive summary, prepared by Jean Hyndman, of our work done over the last while on legal aid. The FLA has been active, meeting with representatives of other organizations and various representatives of legal aid Ontario following the announcement late December of cuts to LAO. LAO invited submissions on proposed changes to LAO’s transparency rules (public disclosure of the money spent, including what lawyers get). Jean Hyndman drafted the attached submissions. Family Law Rules Committee consultations on proposed changes to the cost grid – The FLA did not support the proposed changes, feeling that a cost grid would be of limited benefit to the majority of litigants, primarily in the OCJ. Please see the attached submissions on costs grid, drafted by Jean Hyndman. UFC – Last fall on the Opening of the Courts, the FLA reported that the province seeks to expand UFC province wide. This is an objective that many in the family law bar, including the FLA, have supported for years. Last fall, we invited our membership to comment and early this year we were asked by the SCJ to put our support in writing. Mary Reilly drafted the attached letter of support. Budget Consultations – The Family Lawyers Association provided submissions to the Ontario government on the 2017 Pre-Budget Consultations. The same as in other years: improvements to legal aid, court resources and social benefits. Please see the attached budget submissions drafted by Zeenath Zeath. Please also see the attached 311 Jarvis and North York bench and bar reports. LAO Cuts – The FLA board will be meeting with David Field (CEO LAO) and David McKillop (VP, Policy LAO) later this month. If you have any comments or concerns you would like us to pass along, please email the Chair kjanczaruk@sympatico.ca or Chair LAO Sub-Committee Jean@hyndmanfamilylaw.com. Later this month, the FLA will also be meeting again with the LSUC working group on legal aid. The Advocates’ Society is facilitating a meeting with lawyers who do legal aid work in order to gather feedback on experiences with the legal aid system in Ontario. Last year the FLA sent submissions on the Justice Bonkalo Review of representation in family court by non-lawyers and participated in various meetings, including a consultation with Justice Bonkalo on the issue. The report was due late December but has been delayed. The report is due any day now – we will be looking to it and will no doubt have something to say about it. The Ontario government is considering amending the Family Law Act to harmonize the definition of “child” for support purposes with the definition in the federal Divorce Act. The amendment would expand eligibility for child support for adult children who are unable to support themselves “due to illness, disability or other cause” similar to the Divorce Act. The FLA has been asked to provide its comments. The FLA is working on some educational or social events. More about this later. Click here to download a copy of the FLA’s Submissions on the Motherisk Hair Analysis Independent Review. Click here to download a copy of the FLA’s Supplementary Submissions on the Motherisk Hair Analysis Independent Review. Click here to read the Family Lawyers Association’s Discussion Paper re Domestic Tariff Reform. Click here to review the Proposed Family Law Tariff 2015 – Domestic. As part of our on-going efforts to improve and reform legal aid, we are asking our membership to participate in a survey on the current domestic tariff. The results of the survey will be used in our lobbying efforts with LAO and with the AG to increase the hours allowed under the domestic tariff. We would be grateful if you answered the survey by August 7, 2015! We know how busy everyone is these days – we are very grateful for your support and your participation. Click here to review the Motherisk Submissions made by the FLA.
Join our expert panel for a presentation and discussion regarding the challenging intersections between criminal and family law, in particular: bail conditions, undertakings and custody and access orders; the disclosure of child protection and youth records, (such as section 34 assessments) in different proceedings. Is your client bringing or resisting a Motion to Change child support when income had previously been imputed? The panel will summarize the most important cases, comment on how to best handle disclosure, and provide advocacy tips. Don’t miss this important session! Be sure to come to this program to learn about how to effectively present your case! An understanding about intimate partner violence is essential for those who work in the area of family law. Key not speaker, Howard Hurwitz (MSW, RSW, Registered Social Worker) will provide his valuable insight and tips. This program features Chair, Justice Sheilagh O’Connell, and speakers Sheena Scott (Office of the Children’s Lawyer), Roger Rowe (Barrister and Solicitor), and Shane Foulds (Counsel for the Central Authority, Family Responsibility Office). This program features Chair, Justice Ellen Murray, and speakers, Chris Andrikakis (CCAS Counsel), Lily Ng (Cast Counsel), Tammy Law (Child Protection Lawyer), Katharina Janczaruk (Child Protection Lawyer), and Debate Moderator, Patric Session (Counsel, Officer of the Children’s Lawyer). What happens when you have a claim or a prospective claim with LAWPRO? Inviting family lawyers and social workers to attend for free! This conference is designed to highlight the work of the Toronto Crossover Youth Project, dealing with youth who are involved in both youth criminal justice matters as well as child welfare matters. Professor Judy Finlay, of Ryerson University, and Justice Brian Scully are the co-chairs of this project. Topics include the Child Protection and Youth Criminal Crossover Project, Privacy and Disclosure Issues in Relation to Child Protection, Youth Criminal, Health and Education Records, Seeking Child Support from Parents, and Voluntary Youth Servies Agreements. This program features Chair, The Honorable Justice Brian Scully, Ontario Court of Justice, and speakers Sheila C. Mackinnon, Matthew Eaton-Kent, Lily Ng, and Jane Stewart. This program will provide best practice tips and guidance for effective advocacy in case conferences, settlement conferences and trial management conferences in both domestic and child protection cases. Do not miss this opportunity to hear from experienced judges and family counsel on how to prepare and conduct conferences effectively and persuasively. There will also be an opportunity for discussion and questions. HOW WILL THE NEW ACT CHANGE THE WAY WE PRACTICE CHILD PROTECTION LAW? Join our panel of experienced family law practitioners and hear views from the bench, as they discuss the new changes to the Family Law Rules, review many important existing rules and the effective use of them and shine a light on common mistakes or oversights made by family lawyers. This program features chair, Justice Ellen Murray, and speaker Rollie Thompson, Professor, Author, and Raconteur. Operating a Family Law Practice is a very rewarding but often daunting experience. Please join our panel as they offer practical advice and tips for lawyers of all levels of experience, on starting, maintaining and prospering in Family Law practice. This program features chair, Justice Carole Curtis, Ontario Court of Justice, with speakers Gilead Kay, Solmaz Separy, and Olivia Oprea, all Famly Law Lawyers. Lawyers/Law Students/Court and Social Workers Welcome! This event features Chair, Justice Alex Finlayson, with speakers, Cheryl Goldhart, Goldhart & Associates, and Nicole Tellier, Senior Family Law. Featuring Chair Justice William Sullivan and speakers Tammy Law, Barrister and Solicitor, Robert Shawyer, Shawyer Family Law, and Cathy Tempesta, Office of the Children’s Lawyer. The 12th Annual Family Law Summit is taking place from April 9th-10th, 2018! The event has been accredited for 9.0 Substantive and 3.0 Professionalism Hours towards total CPD Requirements. The FLA is offering group registration at a discounted price. The deadline for group registration is March 15th, 2018. This offer is for FLA members only! The Honourable Justice Sager will be joined by PGT lawyers Anthea Cheung and Olivia Holzapfel to discuss what to expect when the PGT is involved in your Child Welfare Case. 311 Jarvis Open Bar Series presents, “TRAIN YOUR BRAIN: RESILIENCE STRATEGIES FOR STRESS AND BURNOUT IN FAMILY LAW”. Featuring chair, Justice Manjusha Pawagi, and speaker, Dr. Mark Fenske, Associate Professor Dept. of Psychology at the University of Guelph. An overview of family law issues and processes to resolve them. Ideal for individuals dealing with personal family law issues as well as their support network.Reliable and affordable information can help make sense of it all for your clients, their parents (who may be paying the bills), support staff, family support workers, therapists and other professionals. Registration is $75 in advance. This workshop is designed to give self-represented litigants much needed guidance on going to family court without a lawyer. The Top 10 Tips cover how to fill out court forms, negotiate with lawyers, follow court rules and much more. Ideal for clients working with a lawyer on an “unbundled” basis, or those clients who call you but who you cannot assist! Bill 89 (Supporting Children, Youth and Families Act, 2017) was passed and received Royal Assent on June 1, 2017. The first phase of the new legislation comes into force in the fall, 2017, raising the age of a child in need of protection to include 16 and 17 year old youth. Do not miss out on this essential overview and discussion of the new amendments to Ontario’s child protection legislation! The New Professional’s Group of the AFCC-O has developed a new professional development initiative to bring together young family law professionals (lawyers and mental health professionals in their first few years of practice) to examine and discuss interdisciplinary and collaborate approaches to family justice. The Association of Family and Conciliation Courts, Ontario chapter (AFCC-O) is holding it’s ninth annual conference on the 19th (afternoon and evening) and 20th of October (all day). The Pre-Conference Institute, entitled Addiction in Family Breakdown: The Challenge and Complexities” will be held on October 19, 2017 from 2:45 p.m. to 5:00 p.m. The panel will explore the multi-dimensional issues that arise in cases involving addictions, and the impact of addictions on the family law and child protection justice systems. This session will provide an important update and discussion on openness in adoption in child protection cases, including the different statutory pathways to openness in adoption, important best practices in openness applications, and drafting openness agreements. There will also be a discussion of the benefits of openness and some flies in the ointment. From: 4:45 p.m. to 6:30 p.m. This program contains 1.5 hours of substantive CPD. Application for professionalism accreditation pending.